A crucial fact about American medicine goes largely ignored, even by doctors. Dollar for dollar, more people will gain years of healthy lifespan from prevention than from drugs or surgery. We don’t tend to think that prevention costs money. Once you learn that cigarettes cause lung cancer, you can decide not to smoke. The choice is free if you were a non-smoker to begin with. If you get up off the couch and start a brisk walking program to help prevent heart disease, that choice also doesn’t cost a penny. What isn’t free, however, is getting information out there. Poor and less educated Americans are known to have a higher prevalence of major lifestyle disorders like heart disease, obesity, hypertension, and type 2 diabetes. The reverse is also true: better lifestyle choices are made by the affluent and well educated. You can’t prevent what you don’t know about. That makes it essential that we keep funding the most dollar-wise education for physicians so that young residents can go on to spearhead prevention programs. America cannot continue to rely on a reactionary stance of simply treating health issues. It must refocus its efforts and investments in prevention. The surgery to treat a lung cancer patient is highly unlikely to succeed and will be very expensive. Informing a middle-school classroom about the risks of smoking potentially saves lives at a fraction of the cost. I’m a morning person, always have been. I wake up around 5 am and bounce out of bed joy-filled, enthusiastic and ready to consume the day. My energy is at its peak and I feel as though nothing can stop me. However, up until five years ago, I didn’t realize how my morning routine was undermining my ability to be the very best I could be. In truth, it was creating blocks to my most authentic life. You see, I’ve learned that what you do when you first wake up in the morning is a solid gage of not only the quality of your day but by extension the quality of your life. The cure for this is to create a realistic morning routine - a set of rituals that works for you and you alone. There are myriad ways to accomplish this, but I’m going to share the eight that have made the biggest difference for me. I’m not just talking about starting the day off on the right foot – but truly changing your life in just about every way imaginable. As soon as you get out of bed down a full 8-to-16-ounces of clear water. Before your morning coffee or tea, before you take a shower, before you do anything else, drink your water. Your body has been in a state of fasting all night, and this liquid miracle will rehydrate you, make your brain feel more alert, and jumpstart your metabolism. It may also help to fill up your tummy so you don’t overeat at breakfast. Roll right onto the floor (or if it’s too hard for you, lay back down on your bed) taking five minutes to stretch your body. Lay on your back, clasping your knees to chest. Roll from side to side. Remember to breathe deeply throughout your stretching. You’ll most likely hear your spine and joints gently popping as you elongate. Stand and stretch your arms overhead as you gently stretch from side to side. Kneel on the floor and then place your forehead on the ground. Stretch your arms over your head and gently elongate your spine. Be gentle. Think and move like a cat. Stretching in the morning improves circulation and helps to increase the blood flow to your muscles. More blood in your muscles translates into more energy in the morning. It also increases blood flow to your brain and sharpens your concentration. I gave up morning coffee consumption five years ago when out of habit I would lurch from my bed to the kitchen to kidnap an entire pot of bullet-strong Joe and plop down at my desk for the next five hours slamming cup after cup as I bulldozed through work. Hours later when Panache would make it to my desk I was a barking, short-tempered, over-caffeinated hot mess. My gut was ruined and I suffered terrible diarrhea most days. I don’t need to tell you that I was so toxic by noon that nobody wanted to be around me. Now, my morning tea prep is a grace bestowing meditation ritual. I walk slowly, barefoot to the kitchen feeling my feet from heel to toe on the ground. Each step bringing me fully into the present moment. I take down my favorite over-sized Asian blue ceramic cup and put the water on to boil. I turn on music that speaks to my soul as I await the whistling of the tea kettle (absolutely no electric tea kettles for me. I love the old-fashioned sound of a kettle’s whistle.) And then I pour the water over the tea and watch it steep. Although most people still view being sick in terms of germs, catching a cold, and getting a flu shot, the question of who gets sick and who stays well is far more complex. Everyone is exposed to thousands of microbes a day, and some of these are disease-causing pathogens. But we have immunity to a wide range of pathogens, and although sickness is fended off by the cells of the immune system, staying well involves the whole person. There is a medical concept known as “control by the host,” which focuses on how much of staying well is an internal process that calls upon both mind and body. The invisible roots of lifelong wellness turn out to be surprising. For example, researchers at the University of Texas Medical School looked at mortality rates among a group of men and women who had received open heart surgery, including heart bypass and replacement of the aortic valve. If you take the routine medical approach, the reason someone dies six months after open heart surgery while someone else doesn’t must come down to a physical difference. But the team headed by Dr. Thomas Oxman took an unorthodox approach. They asked these patients two questions about their social situation: Do you participate regularly in organized social groups? Do you draw strength and comfort from your religion or spiritual faith? Whether you’re an experienced yogi or are just starting with your practice, there’s a good chance you’ve noticed some of the health and wellness benefits of yoga. Perhaps you’re sleeping better or feeling stronger or are just more relaxed and at ease in your daily life. Whatever the case may be, you know that something good is happening to your body–even though you may not be linking it to your practice quite yet. To help you better understand the benefits of yoga, we have looked at the many ways your practice can heal the mind, body, and spirit. We included also links to scientific studies backing these claims. Curious? Read on to find out the benefits of yoga on the mind, body, and spirit. Now that we are stepping into the second month of the year,I feel all of us are more relaxed about our performance through the year. The initial euphoria of the new year year and it's newer resolutions is sort of settled into a routine. And yet at the back of our minds lurks this constant need to perform in a manner that leads us to a stress free life. Happiness is the motivational goal which remains a constant obsession as it should. Our main purpose on this planet is joy and inching towards it everyday is our essential need and desire. Over the years as we allow stress to take a toll on our lives, we seem to have stopped living in our natural state which is joy. As children while we were growing up, joyful living was a natural part of our lives and we didn't have to consciously think about it. So now perhaps we should just switch on our childhood mode to reach that sense of emotional level of comfort and joy. Go into your childhood and connect to the child within you. Think about how relaxed you were and how your thought patterns worked when you were living in those blissful times. Connect backwards in time and live those days . Adult stress relief strategies seem so much simpler and more effective when we link them to our past happy experiences. In 1952 a young British physician made a mistake. It was a mistake that was to bring short-lived scientific glory to Dr. Albert Mason. Mason tried to treat a fifteen-year-old boy’s warts using hypnosis. Mason and other doctors had successfully used hypnosis to get rid of warts, but this was an especially tough case. The boy’s leathery skin looked more like an elephant’s hide than a human’s, except for his chest, which had normal skin. Mason’s first hypnosis session focused on one arm. When the boy was in a hypnotic trance, Mason told him that the skin on that arm would heal and turn into healthy, pink skin. When the boy came back a week later, Mason was gratified to see that the arm looked healthy. But when Mason brought the boy to the referring surgeon, who had unsuccessfully tried to help the boy with skin grafts, he learned that he had made a medical error. The surgeon’s eyes were wide with astonishment when he saw the boy’s arm. It was then that he told Mason that the boy was suffering, not from warts, but from a lethal genetic disease called congenital ichthyosis. By reversing the symptoms using “only” the power of the mind, Mason and the boy had accomplished what had until that time been considered impossible. Mason continued the hypnosis sessions, with the stunning result that most of the boy’s skin came to look like the healthy, pink arm after the first hypnosis session. The boy, who had been mercilessly teased in school because of his grotesque-looking skin, went on to lead a normal life. Wondering about the best thing to drink when sick? Drink these comforting, healing beverages when you’re sick to boost your immune system and get well again quickly. The weather may be dreary, but you’re feeling cheery… until, suddenly, sickness strikes. The soreness in your throat. The achy feeling in your body. The extreme lack of energy. Even your mood turns sour. As the signs of sickness set it, you may be tempted to lay on the couch and feel bad for yourself. And yes, you do need rest (and a good dose of zzzzzzs). But why not use this as an opportunity to take care of your health? Choosing healthy, fresh, whole plant foods may be the best way to care for your body in its time of need. And doing your best to prevent illness before symptoms hit is always a good idea. What Should You Be Drinking When You’re Sick? You’ve probably heard it before. When you’re sick, you need to drink plenty of fluids. It’s true. You want your body to be well-hydrated so it can fight off germs. It’s true that most people don’t drink enough water. But as in so many things, the answer is balance. Even when you’re well, drinking too many fluids can overwhelm your kidneys and liver, making it harder for them to get rid of toxins. Instead, you may want to drink a little more than the often recommended eight glasses of fluid throughout the day (and pay attention to your body). Doing this should help you get what you need without going overboard. You may not feel like drinking anything. (If so, I get it. In college, I ended up in the ER from dehydration when I got the flu.) But you really do need to drink a good amount of fluids when you’re sick. 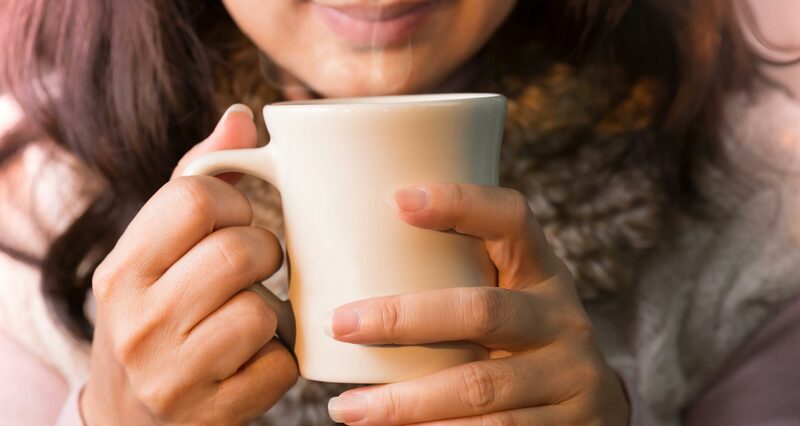 Do Hot Liquids Ease Cold and Flu Symptoms? Hot liquids, like a warm cup of tea, are said to clear up congestion — but is this true? The answer is yes. Researchers at the Common Cold Center at Cardiff University in Britain investigated this claim. Their results supported the belief that hot drinks can provide helpful relief for most cold and flu symptoms. The hot drinks provided immediate and sustained relief from a runny nose, coughing, sneezing, a sore throat, chilliness, and tiredness. On the other hand, the same drink at room temperature only provided relief from a runny nose, coughing, and sneezing. No liquid will magically make your symptoms disappear in a snap. But these libations are good for your body and won’t cause nasty side effects (like you need that). And they can help revive your spirits, too. When I’m feeling under the weather, I typically don’t want to make complicated foods and drinks. So these suggestions are not only healthy and comforting but also quick and easy, too. Try these home remedies for cold and flu and see if they help you. Do you find yourself tossing and turning at night, thoughts and worries from the day running through your mind like a movie reel? Worry and trouble falling asleep tend to go hand in hand, as both have their roots in Vata dosha. Vata governs movement in the mind and body. It controls your blood flow, your elimination, the rise and fall of your breath, and the movement of your thoughts and emotions. If Vata has fallen out of balance, which is easy in Vata season (late fall and winter), you might notice an increase in anxious feelings and difficulty sleeping. Fortunately, with a few simple diet and lifestyle changes, you can improve the quality of your sleep. Rather than treating symptoms, Ayurveda offers a holistic approach to address the root cause of worry and trouble falling asleep. Try a few of these tips for a better night’s sleep. When people think about growing old, they blame the passage of time—the years roll by, and the body stops looking younger year by year. But the latest science disputes this view. A person ages because the cells in their body age, and cells live only in the present. This is one reason memory remains such a mystery. Brain cells function through electrochemical activity that occurs the instant a chemical reaction or electrical impulse is able to occur. There are no pauses to think about reacting; if the potential is there, the action must follow. Whatever a brain cell does, it can’t go back to the past. So how do we seem to go back into the past when we remember a childhood birthday party or our first kiss? No one knows, but when the answer is found, it won’t involve time travel, either forward or backward. If you expand this to every cell in the body, they too must function instantly in the present moment when any two molecules interact. So the problem of aging can be stated as the gap between how a cell lives and how a person lives. As people, we repeat the past, get stuck in old habits, cling to stubborn beliefs, fear the future, and in general occupy mental states that are not in the now. If you can return to the now, you close the gap between your life and the life of your cells, and by doing this, you can prevent aging or even reverse it. Aging isn’t one thing but a complex of possibilities. Which possibilities get triggered is infinitely complicated, but no one has ever shown that any symptoms of aging must occur. Even though we can all tick off the disagreeable signs of growing old—creaky joints, wrinkled skin, loss of energy, erratic sleep, declining memory, and so on—there is someone who has actually improved as they aged in each of these areas, except perhaps for wrinkles. However unusual, there are individuals who retain limberness, energy, good sleep, mobility, and memory. Colds & flu — achoo! Is everyone around you coming down with colds and flu? And those nasty respiratory infections that linger so much longer than anyone expects? That’s February. A volatile month, a gauntlet we run to make it to spring. Whether you’ve got kids in school, like little Petri dishes scooting around, or you’re hopping on an airplane, or shoulder to shoulder on the subway, unless you live in a bubble, you are vulnerable. What can you do to prevent colds and flu? When it comes to the healthiest diet for your heart, there's a lot of confusing information about which foods protect and which ones promote heart disease. Much of the heart healthy food debate stems from outdated dietary guidelines and inconclusive scientific studies. While outdated, the common dietary intervention is based on the idea that dietary cholesterol and saturated fats promote high cholesterol and increase the risk of heart disease. This idea is known as the diet-heart hypothesis. This hypothesis, which has been around since the 1940's, was such a game changer in the medical community at the time, that a low-fat, low-cholesterol, and high carbohydrate diet became gospel for preventing and treating high cholesterol and heart disease. But there are many flaws with the diet-heart hypothesis. According to the president, Sylvan Lee Weinberg, of the American College of Cardiology, these recommendations may have lead to the unintended consequences of obesity, lipid abnormalities, type 2 diabetes, and metabolic syndrome (1). I'll never forget sitting in a nutrition lecture when I was in culinary school and my teacher told us she reversed her high cholesterol by eating 9 eggs a day! How could that be since eggs are high in cholesterol and saturated fats? In fact, research has shown that egg consumption is not associated with increased risk of cardiovascular disease and cardiac mortality in the general population (2). Many studies have emerged since the diet-heart hypothesis that indicate dietary cholesterol has little impact on blood cholesterol levels. About 25% of the population, known as "hyper-responders", show a slight increase in their blood cholesterol levels in response to dietary cholesterol, but even in this group their blood cholesterol levels are not clinically significant. Get an overview of vegan statistics from around the world. See why so many people are going vegan — from athletes to celebrities to everyday people. The rise of plant-based diets is here to stay. Diets that limit or exclude meat, dairy products, and eggs used to be on the fringe and were seen as fads. Identifying as vegetarian, vegan, or plant-based was often viewed as weird or extreme — more the domain of hippies and activists than of large numbers of everyday people. Until recently, references to vegan eating in the mainstream media were often negative. And meat-free food options weren’t universally available or appetizing. But now, all that is changing. Much of the world is trending towards plant-based eating — and this global shift could be here to stay. Millennials are central drivers of this worldwide shift away from consuming animal products. But the plant-based movement is bigger than any one generation. Everyone from celebrities to athletes to entire companies including Google and countries as big as China are supporting the movement to eat more plant-b ased foods. Plant-based eating may not be entirely mainstream yet. But it’s becoming more accepted every day. And this trend is having far-reaching impacts. First of all, according to a forecast report by restaurant consultancy group Baum + Whiteman in New York, “plant-based” will be the food trend of 2018. The report also anticipates that plant-based foods will become the new organic. People have a tendency to overlook their stress. Every few days I like to write about the benefits of an overall plan for managing stress as I do realise the importance of it from my personal counselling sessions with my clients. From time to time we need to address the concept of stress management within us. It is not a one time strategy you apply, its an ongoing process you need to keep track of. It is important that you should have an overall plan for managing your stress and not allow your stress levels to rise high before you start handling them. I feel the need to talk about the avaliable recourses for handling most of the stressful situation's . The smart thing is to combat our own stressful personal scenarios with the recourses available to us. Most of the time we remain abreast our stressful situation when we keep ourselves on a higher level of awareness and conciousness. It is only when you deal with stress in less than healthy ways that you compound the negative impacts of stress on your health. It can be that your responses to stress make the challenges you feel, more challenging . This is the most important aspect of stress management. We need to create a lifestyle in sync with our values, a schedule to create health promoting habits. We need to understand how to deal with the negatives life metes us on the platter and move our perspective according to our challenges. Yet many a time we realise that despite all our efforts stress is throwing us off balance. We need to realise that life does not always turn the way we plan and "true balance " is not a continuous state. There could be many factors that throw things off the scheduled path. Millions of Americans of all ages are affected by sleep problems — many with severe, chronic sleep deprivation. A round-the-clock, activity-driven society has meant that many individuals habitually defer sleep to get other things done. "I'll catch up later" is, however, easier said than done. Recent research indicates that pervasive sleep deprivation can lead to more serious health problems than just a dull, clouded feeling the next morning — including obesity, high blood pressure and diminished resistance to infections. While there is substantial awareness about the need for proper nutrition and exercise, many people tend to shrug off lack of sleep as not being of much consequence, and, as a result, go through life with both mind and body always performing at less than optimal levels. According to The Council of Maharishi Ayurveda Physicians, sleep is one of the supporting pillars of life. Along with diet, sleep is critical to good health and well-being. Quality sleep acts as a rejuvenator of mind and body, enabling us to function at peak levels during our waking hours. Even powerful medicine is of little use if the fundamental pillars of life are not strong and solid. Sleep is important because it enhances ojas — considered in ayurveda to be the master coordinator between mind, body and the inner self. Ojas is the finest product of digestion, the main life-supporting force within the body. It acts like a shock absorber, helping to insulate the mind from day-to-day stress and enhancing the body’s innate immune systems. This week, I found myself really trying to find the light in the cracks. That’s not always an easy thing to do, especially if you focus your attention on the blame game coming out of Washington right now with regards to the government shutdown. I mean, really? Who cares? Just fix it. To me, though, there was a lot of light to be seen this week. I saw the light shine through in the women’s marches that were held around the world on Saturday, and which continue today. People are using their voices to stand up for their rights, and for those of others, and that’s a powerful thing. I also saw the light this week coming from voices like Olympian Michael Phelps, who bravely opened up to CNN’s David Axelrod about his battle with depression and thoughts of suicide. That sort of honesty and truth will hopefully help many people who are suffering from the same thing know that they are not alone.I also saw the light this week in the news about our president taking a test to assess his cognitive health. I was especially pleased that his doctor spoke about the test and even directed people to take it. If an epidemic is defined as a disease that affects whole populations without having a medical cure, then the epidemic of modern life is stress. Itself not a disease, stress instead leads to a breakdown in the body's internal balance, or homeostasis, and from that point onward, if the stress isn't relieved, damage occurs from within. Ironically, most modern people in a developed country do not experience acute stress, the kind that triggers a full-blown fight-or-flight response. There is no battlefront, civil war, rampant violent crime, or struggle over food and water to contend with. With the many obstacles we face on a daily basis, it is easy to fall victim to negativity and fear. The level of possible difficulty we may need to face in life knows no limit. Not assuming the worst case scenario can be difficult. There are two major reasons for this. First, it is the job of the left-logic side of the brain to assess all possible outcomes in an effort to prepare us and protect us against what is to come. Secondly, it is a chance for our pain bodies to feed. While watching this process in myself, I noticed that my mind brought several different negative outcomes and inspired fear and dread when I was faced with even simple changes and obstacles. I had to deliberately change the course of things if I wanted to be solution oriented. As people we end up stewing over possible negative outcomes before seeing that the situation is working itself out. For the most part, things work out in the best possible way. Yet we will fall prey to this mechanism almost every time we are faced with change. Beth Kirby is a photographer, cookbook writer, entrepreneur, and the creator of Local Milk, her food, travel, and lifestyle blog. We are endlessly amazed by Beth’s ability to present her work with both authenticity and style, and we were completely blown away by each one of her thoughtful and inspiring answers in this interview. It’s a true gem. In this dialogue, Beth tells us about self-care as the foundation for happiness, having a schedule as a way to avoid stress, why she doesn’t believe in the idea of work-life balance, and how her routine has changed since becoming a mother, as well as her newfound love for weight training, the adaptogens and herbs she incorporates into her everyday potions, beauty, motivation, sustenance, and much more. There’s some amazing business advice here, too! — Is routine important to you or do you like things to be more open and free? Routine is so very important to me. Routines ensure that time is carved out for the important things in my days & life. I’m super flexible with my routines so there’s no such thing as “failing”, but the closer I adhere to the routine, the more impact I tend to make in my day. — What do your mornings look like? If they differ from day to day, describe your ideal morning. I actually just wrote a little guide to a slow morning routine that details mine! I usually wake up when my baby wakes up, between 6:30-7:30 AM. The first thing I do every morning is make the bed because I feel this sets the tone for the rest of my day. My husband takes the baby to give me 10 minutes to meditate (I love the Headspace app) and do a few sun salutations to wake my body + mind connection up. After that I brew my morning elixir, a simple lemon, ginger, and turmeric tea, and then I do some journaling while I drink it. After that comes breakfast & a matcha potion, a shower & getting dressed for the day, a quick tidy of my space if I need it, and then I’m down to work! I don’t always do every single thing, but the more of them I hit, the better my morning! — Do you have any bedtime rituals that help you sleep well? — How has your routine changed since you had your daughter? It’s gotten a lot more flexible! If she’s having a bad morning, things like preparing breakfast can take a lot longer or maybe I skip the shower (truth time! ), but in a lot of ways, it’s made me more routine because if I don’t have a plan and stick to it, the day can slip away a lot more easily when you have kids. I kinda floated through my days doing whatever I wanted whenever I wanted before she was born because I had all the time in the world. Now it’s make hay while the sun shines or forget having any hay! Haha. Inflammation has always been a medical mystery, but now it has become an enemy of long-term health. On the one hand, when your skin turns red, swollen, and painful after you burn yourself, which triggers acute inflammation, the response is normal and beneficial. Extra red blood cells, immune cells, and anti-oxidants are rushing to the wounded site to heal it. But carried too far, inflammation can be fatal, as when someone is too burned to recover. Only in the past few decades has it dawned that low-level chronic inflammation, which usually goes completely unnoticed plays a part in many lifestyle disorders such as hypertension, heart disease, cancer, and Alzheimer’s. Chemicals known as inflammation markers can enter the bloodstream in various ways: from the intestinal tract (so-called leaky gut), as a reaction to infection, or through the action of the immune system in other internal ways. The slow drip, drip of inflammatory markers can take years to create major impairment, which means that each person must tailor his lifestyle to counter them. Diet alone isn’t enough to keep chronic low-level inflammation at bay, but it’s a good start. By adopting an anti-inflammation diet, you aim at two positive results: keeping the micro-organisms in your intestines healthy and flourishing, and thereby preventing the seepage of toxic chemicals into the bloodstream. There is also the indirect benefit that a healthy digestive system sends signals of wellbeing along the vagus nerve to the heart and brain.